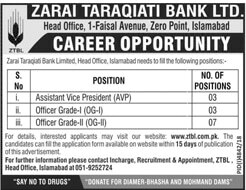 Zarai Taraqiati Bank Jobs 2019, Application are invited for following position in ZTBL. ZTBL (Zarai Taraqiati Bank Ltd.) is one of the well-known banks. Currently, this reputed Bank is looking to recruit highly educated, very experienced, hardworking and well-disciplined candidates for the following positions given below. Interested candidates may apply online through www.ztbl.com.pk. The last date for submission of application is April 28, 2019.